This week’s spotlight was a pretty controversial product at the crowdSPRING office. When I brought it to the lunch table and announced what it was, people were skeptical, even downright cynical. But to those that were adventuresome enough to try it, it ended up being a tasty treat. What was it, you ask? Simple Squares. Made with only six ingredients, these confection bars are wheat-free, gluten-free, dairy and soy-free, refined-sugar free, uncooked, and kosher. They’re basically everything that’s good for you. And, as an added bonus, they’re delicious. I could’ve eaten the whole box that was sent to us, but felt obligated to share. I’ll leave you with the review of our customer service director, Kevin, who put it better than I can: “These taste like summer. I’m into it.” Be sure to check out their site to find where you can get your own Simple Squares. We create healthy and all-natural, gluten free snack bars. I firmly believe that delicious and good-for-you treats need not be complicated. This passion fueled the desire to create a snack made of simple, unprocessed ingredients free of wheat, gluten, dairy, soy and refined sugars. Thus was born, the Simple Square. We differentiate ourselves by using only whole food ingredients (just 6 per square) and infusing the Squares with herbs, creating savory-sweet snacks. Although many ‘household name’ food companies co-package other brands, they are quite covert about their role. It took about a year for me to find a company that fit all my criteria and could produce a quality Square. One of my biggest takeaways from my former employer, Morningstar, Inc., was the importance of design when formulating my company’s brand. Serendipitously, I was in attendance at an entrepreneurial conference hosted by Northwestern Law School’s Small Business Opportunities Center (a great legal clinic for emerging businesses) where one of the panel members mentioned the creative auction house. The process of giving up my ‘day job’ to focus full time my on my passion turned business. Many of my back end systems were put in place prior to product launch which was a life saver. In addition to crowdSPRING some of the best Simple Squares uses: Zoho – CRM/Inventory management, Mailchimp – publishing platform, Quickbooks – accounting software. As an entrepreneur and jack-of-all-trades within your own company, it is exciting to figure out what initiatives require the most attention once you go live. For anyone just starting out, I recommend establishing a schedule based on activities conducted within your first few months of business and naturally the projects that are most important will rise to the top. 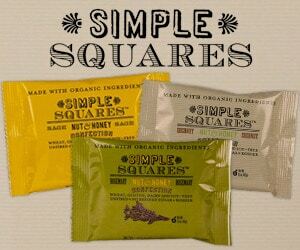 We were debuting Simple Squares at the Natural Products Expo West Trade Show in Anaheim, CA and the day before the show began we still did not have our product in hand. The pilot bars arrived at our hotel the day of the show and (thankfully!) were spot on. Turns out a week later, something changed. It took 6 months to troubleshoot the issue. I found that, much like construction, everything takes longer than you initially estimate – plan accordingly. I would have turned to crowdSPRING earlier! While it was a good exercise to research corporate design firms upfront, crowdSPRING was the best choice for my business just starting out. Aside from that, it’s hard to say as I believe that every experience puts you in a position to learn. In hindsight, it is often the experiences you contemplated doing differently that proved to be the most beneficial – lack of success opens you up to new opportunities. It’s how you handle those opportunities that makes the difference. We are currently in national distribution where I hope to see our current fan base grow. Eventually we will spread our healthy snack revolution internationally. We hope you’ll join us in our mission to provide simple, great tasting and healthy sweet treats. What’s your working relationship like now with the crowdSPRING designer’s project you chose? We partnered with our crowdSPRING designer for almost a year after our project – she was fantastic. As we continued to grow, we found our needs were best met by having the ability to hold in person meetings with our creatives. I knew a local designer whom I contacted and is successfully moving us forward. However, if I had not known this person, I would have sought out a local on line at crowdSPRING.